With the news of Strange Chemistry's untimely end, I rushed to obtain a few of their print copies. And they arrived in time for this post! 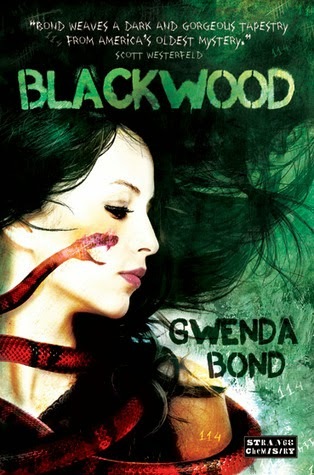 After Blackwood, I'm expecting good things from The 57 Lives of Alex Wayfare, Stolen Songbird and The Woken Gods. I picked up Bronze Gods on a B&N outing, and I also grabbed Thief's Covenant online; it was $4.00 with shipping. Yep, I couldn't resist. There would have been more in this section, but it seems that Better World Books doubled all their prices recently. Now you need a 45% off sale to pay previously regular prices. And their inventory isn't all it used to be. Update: I just checked and their prices seem to be back to normal. Maybe it was a display glitch, possibly because they're now offering full price(?) new books? Either way, the good prices are back! Balancing that out, I learned yesterday I won a book giveaway! Many, many thanks to the lovely Dahlia Adler who offered any of the OneFour KidLit's releases in honor of her debut, Behind the Scenes. Enjoy the SC titles. I only really really favored Stolen Songbird out of the ones I've read. I really enjoyed Bronze Gods - and I recently was sent Thief's Convenant - looking forward to reading it! Thank you! I'm curious; how many Strange Chemistry titles have you read? I think I'm up to 4 now (and the 4th one was the only one I fully liked). I am totally interested in The Lazarus Machine now! Cant wait to see your review!! Thank you! It's moving pretty fast and I'm really liking the technology. I read one of Wells' "Emilie" books, but I haven't read Lam yet. I wonder if the ebooks will remain available despite the imprint closing? Oo, so I saw your post when Better World Books was being sad, but this update is exciting since I didn't realize they had such great deals *plots* also yey, I hope you enjoy all the Strange Chem books! Oh yeah, they're my go-to for used books. Thank goodness they extended that 45% off sale when they found the glitch...although it may have resulted in my buying *cough* nine books. But it was only $23-24. That makes it okay, right? As long as I wait and only buy during the 40-45% sales?